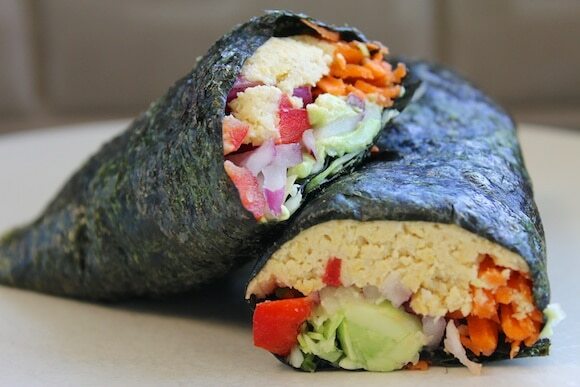 These California-style Vegan Sushi Rolls are jam-packed with hummus, veggies, and flavor! They’re easy to make for a healthy and delicious lunch. I use toasted nori sheets that I buy in a package of 50 from my health food store. They don’t need to be warmed up or anything, you just lay them on a cutting board to fill them up (note: you can also buy untoasted nori, but I think they taste a little too much like seaweed when they’re raw). It’s nice to start with some kind of creamy filling like my Roasted Garlic Hummus, for example. Then, you can just layer in your other veggies, being careful not to overfill. Just think of it like a burrito. If you want even more protein, feel free to add some tempeh, too. A great on-the-go lunch option, filled with veggies and flavor. Place the nori sheets on a flat surface for filling. Slather the hummus on each sheet, topped with bell pepper, shredded vegetables, onion, and avocado. Roll each sheet into a burrito and use a sharp knife to slice each roll in half. I hope you love these healthy sushi rolls! Tell me what your favorite raw veggies are in a dish like this. Join my weekly newsletter list to get all the latest news and recipe links delivered directly to your inbox. Sign up now and unsubscribe at any time. I will never sell your name or spam you, I promise! That wrap looks delish- and thanks for the food processor tip- so smart! I love seaweed! Such a cool recipe – I love raw vegan recipes & blogs like yours because they’re SO CREATIVE. I would never think of that! 🙂 Can’t wait to give this a try and report back. And whale watching! Very cool – I want to try this out too. I think they have it near where I am as well. I would love to do a whale watching trip, what a fabulous experience you had. I just came back from Fuhrman’s Italy getaway and we had Nori rolls one day at lunch, but instead of hummus they used grated raw cauliflower. It looked like rice but tasted very good. 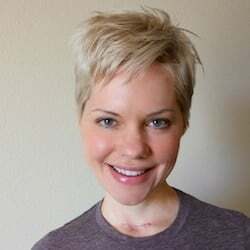 Hi Jeanne! I just e-mailed you to ask you more about your trip. It sounds fantastic. 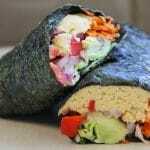 Plus, I love the idea of using grated cauliflower in a nori roll. LOVE the Day out at Sea photos! That California Wrap looks amazing, too! I’m totally LOVING your App! SOON I will be posting your Herb Dressing on my blog! I will let you know when it’s up! Yum, yum, yum! I was just thinking about making some nori rolls the other day. These delicious photos might have just pushed me over the edge to make some. Thanks for the inspiration! Hi Carrie, Yes, I agree, this weekend did go by so fast. I was so busy this weekend, but it feels good to have accomplished so much, and now I can enjoy the fruits of my labor. 🙂 That’s so cool that you got to see some whales! I’m happy you had a wonderful day. Thank you for the new vegan sushi rolls recipe, and the idea on pre-shredding veggies for the week. I’ll plan to do this too, because I think it’s a great idea for getting even more veggies in to the week conveniently. And, I’ll definitely make the vegan sushi rolls soon. They look so delicious and refreshing. Hip surgery for me tomorrow….and I’m all ready now. Just making a few more recipes to freeze today. Your blog will keep me company while on sick leave. I’m loving your app, and I’m telling folks about it. I’ll remember to go on iTunes this week and rate it. Wow, yours look so pretty. I usually scoop the pulp from my juicer into mine and mix with my carrot mayo or raw caramelised onions. Generally, mine end up a bit of at (tasty) mess. The whale watching sounds awesome and Santa B looks so tranquillo! Don’t you just love Cali?! Looks great! What an interesting use of nori sheets. These will be on my soon to-do list. By the by, I made the almond butter banana muffins … another keeper! … sooooo quick and delicious. Next time I think I’ll include chopped walnuts too. Would love to get your app but it is available for iPhones only, isn’t it? Thanks, Anja! Yes, for now, the app is only available for iPhones and iPads. I’m sorry about that! Thank you for the note. The party will be GREAT this week! We are giving away a tote full of goodies from Namaste Foods! The items are gluten free and allergy friendly! Can’t wait to see what you bring to the party! I just made your California-style nori rolls for lunch. Tried just one to see if I’d like it & had to make numero dos! Yummy! It’s weird how filling they are. I’m thinking black bean noodles as a filler too! You always have such good ideas… things I’d never think of! You rock! Your sushi looks amazing. I can’ wait to try it. Just pinned it for future. Your sushi looks amazing! 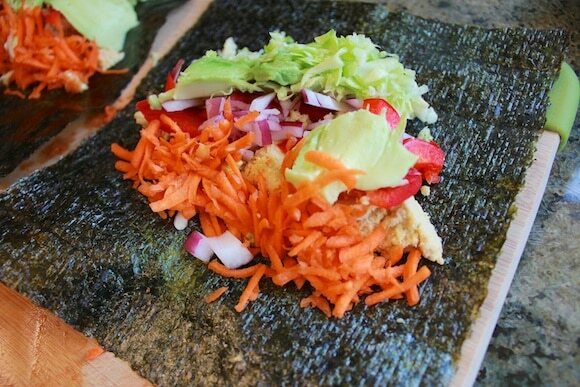 I already love using nori as a sandwich wrap and can’t wait to try this variation. 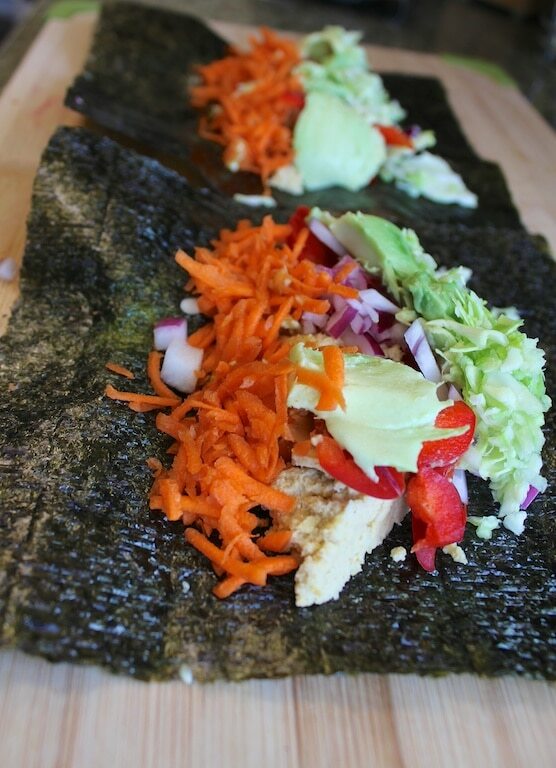 BTW, has your nori ever become soggy when you make wraps with “wet” spreads like hummus? I made a wrap once with a nut pate and the nori became very chewy (not good eats). Hi Sadie! I have not had that problem with the nori getting soggy, probably because I eat the rolls pretty soon after I make them. I also like to toast the nori first (or you can buy it pre-toasted) and I think that helps keep it crisp. Such an easy and fresh lunch option! I just had these for dinner and they are so good! 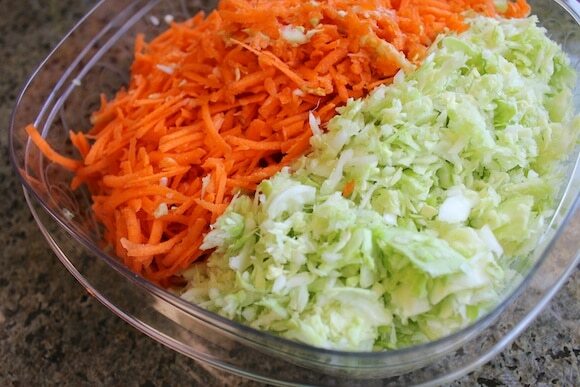 Also, thanks so much for the tip about shredding the carrots and cabbage for the week. I’m so doing that from now on!!!! GREAT, Vicky!!! So glad you liked this recipe, and the tip. XO.